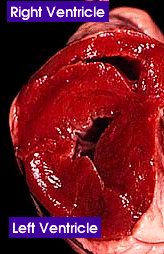 This photo shows the adult cow heart cut in cross section through the ventricles, with the smaller right ventricle at top and the larger left ventricle at the bottom. The two are separated by the interventricular septum, and this example shows that the left ventricle's walls are much thicker (and stronger). Only the ventricles are visible in this photo. From the right atrium, deoxygenated blood passes through the tricuspid valve (right AV valve) into the right ventricle which pumps it to the lungs to pick up oxygen (and release carbon dioxide) in the adult. This oxygenated blood returns to the left atrium via the pulmonary veins, passes into the left ventricle through the mitral valve (left AV valve), and is pumped out through the aorta to the body. Because the systemic circuit is long and has a high resistance to blood flow, the left ventricle must be very strong to pump at high pressure; this is why it is more thick even in the healthy individual.